The vertical stabilizers, vertical stabilisers, or fins, of aircraft, missiles or bombs are typically found on the aft end of the fuselage or body, and are intended to reduce aerodynamic side slip and provide direction stability. It is analogous to a skeg on boats and ships. On aircraft, vertical stabilizers generally point upwards. These are also known as the vertical tail, and are part of an aircraft's empennage. This upright mounting position has two major benefits: The drag of the stabilizer increases at speed, which creates a nose-up moment that helps to slow down the aircraft that prevent dangerous overspeed, and when the aircraft banks, the stabilizer produces lift which counters the banking moment and keeps the aircraft upright at the absence of control input. If the vertical stabilizer was mounted on the underside, it would produce a positive feedback whenever the aircraft dove or banked, which is inherently unstable. The trailing end of the stabilizer is typically movable, and called the rudder; this allows the aircraft pilot to control yaw. Often navigational radio or airband transceiver antennas are placed on or inside the vertical tail. In all known trijets (jet aircraft with 3 engines), the vertical stabilizer houses the central engine or engine inlet duct. Vertical stabilizers, or fins, have also been used in automobiles, specifically in top level motor sports, with the concept making a resurgence in both Formula 1 and Le Mans Prototype racing. A few aircraft models have a ventral fin under the rear end. Normally this is small, or can fold sideways, to allow landing. Both the North American X-15 supersonic/hypersonic experimental aircraft, and the late World War II German twin-engined Dornier Do 335 heavy fighter used differing forms of the cruciform tail stabilizing surface format. The vertical stabilizer is mounted exactly vertically, and the horizontal stabilizer is directly mounted to the empennage (the rear fuselage). This is the most common vertical stabilizer configuration. A T-tail has the horizontal stabilizer mounted at the top of the vertical stabilizer. It is commonly seen on rear-engine aircraft, such as the Bombardier CRJ200, the Fokker 70, the Boeing 727, the Vickers VC10 and Douglas DC-9, and most high-performance gliders. 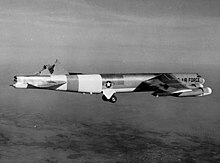 T-tails are often incorporated on configurations with fuselage mounted engines to keep the horizontal stabilizer away from the engine exhaust plume. T-tail aircraft are more susceptible to pitch-up at high angles of attack. This pitch-up results from a reduction in the horizontal stabilizer's lifting capability as it passes through the wake of the wing at moderate angles of attack. This can also result in a deep stall condition. T-tails present structural challenges since loads on the horizontal stabilizer must be transmitted through the vertical tail. The cruciform tail is arranged like a cross, the most common configuration having the horizontal stabilizer intersecting the vertical tail somewhere near the middle. The PBY Catalina uses this configuration. The "push-pull" twin engined Dornier Do 335 World War II German fighter used a cruciform tail consisting of four separate surfaces, arranged in dorsal, ventral, and both horizontal locations, to form its cruciform tail, just forward of the rear propeller. Falconjets from Dassault always have cruciform tail. Rather than a single vertical stabilizer, a twin tail has two. These are vertically arranged, and intersect or are mounted to the ends of the horizontal stabilizer. The Beechcraft Model 18 and many modern military aircraft such as the American F-14, F-15, and F/A-18 use this configuration. The F/A-18, F-22 Raptor, and F-35 Lightning II have tailfins that are canted outward, to the point that they have some authority as horizontal control surfaces; both aircraft are designed to deflect their rudders inward during takeoff to increase pitching moment. A twin tail may be either H-tail, twin fin/rudder construction attached to a single fuselage such as North American B-25 Mitchell or Avro Lancaster, or twin boom tail, the rear airframe consisting of two separate fuselages each sporting one single fin/rudder, such as Lockheed P-38 Lightning or C-119 Boxcar. A variation on the twin tail, it has three vertical stabilizers. An example of this configuration is the Lockheed Constellation. On the Constellation it was done to give the airplane maximum vertical stabilizer area while keeping the overall height low enough so that it could fit into maintenance hangars. A V-tail has no distinct vertical or horizontal stabilizers. Rather, they are merged into control surfaces known as ruddervators which control both pitch and yaw. The arrangement looks like the letter V, and is also known as a butterfly tail. The Beechcraft Bonanza Model 35 uses this configuration, as does the F-117 Nighthawk, and many of Richard Schreder's HP series of homebuilt gliders. Winglets served double duty on Burt Rutan's canard pusher configuration VariEze and Long-EZ, acting as both a wingtip device and a vertical stabilizer. Several other derivatives of these and other similar aircraft use this design element. Fin is an alternative name for the vertical stabilizer. The vertical stabilizer often employs a small fillet or "dorsal fin" at its forward base which helps to increase the stall angle of the vertical surface (thanks to vortex lift) and to prevent a phenomenon called rudder lock or rudder reversal. Rudder lock occurs when the force on a deflected rudder (in a steady sideslip) suddenly reverses as the vertical stabilizer stalls. This may leave the rudder stuck at full deflection with the pilot unable to recenter it. The dorsal fin was introduced in the 1940s, like for the 1942 Douglas DC-4, predating the wing strakes of the 1970s fighter prototypes like the YF-16 (developed into the F16) or YF-17 (developed into the F18). While vertical stabilizers have also been used in some race cars, such as the 1955 Jaguar D-type, the concept has seen sparing use until recently when the concept has seen a resurgence in Formula 1 and Le Mans endurance racing. The ostensible purpose of this is primarily to reduce sudden high speed yaw induced blow overs that would cause the cars to flip due to aerodynamic lift when subject to extreme yaw angles during cornering or in a spin. In addition to this, some Formula 1 teams utilized the wing as a way to disrupt the airflow to the rear wing reducing drag, the most radical system being the "F-duct" found in the MP4-25 (and later copied by Ferrari in the Ferrari F10), which could divert air from a duct in the front of the car, on demand by the driver, through a tunnel in the vertical fin onto the rear wing to stall it and reduce drag on the straights on which downforce wasn't needed. The system has since been banned for the 2011 Formula 1 season. For Le Mans Prototypes, the vertical stabilizer has become mandatory for all newly homologated sports prototypes. ^ Kumar, Bharat (2005). An Illustrated Dictionary of Aviation. New York: McGraw Hill. p. 272. ISBN 0 07 139606 3. ^ Bjorn Fehrm (March 1, 2019). "Bjorn's Corner: Yaw stability, Part 2". Leeham News. ^ "The New Audi R18 LMP1". 2010-12-13. Retrieved 2011-03-30.